Heroes of Stalingrad will focus on the Battle of Stalingrad and the surrounding operations, both German and Russian, from July 1942 to February 1943. The game allows the player to experience one of the most brutal battles in all of human history. Delivering unrivalled accuracy and attention to detail, along with gritty, vicious combat in multiplayer and single-player modes the game will feature everything from quick, brutal firefights to more intricate and challenging tactical modes. Red Orchestra multiplayer taken to new heights: The brutal, gritty Red Orchestra gameplay has been enhanced, expanded and made more accessible. 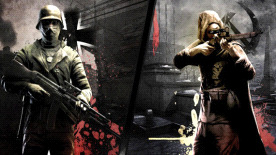 Gameplay modes as instantly recognizable as Firefight (Tripwire's take on Team Death Match), single-life gaming redefined in Countdown mode - and the Territory mode already beloved by the hundreds of thousands of Red Orchestra players worldwide. Stalingrad Campaign: Before heading online hone your skills in one of two campaigns that recreate the battle for Stalingrad from both the German and Russian sides. Featuring open non-linear environments and unscripted gameplay players make their own path through the battlefield. Heroes: Achieve the ultimate goal and become a Hero online. Players with hero status inspire troops around them and cause fear in their enemies. Heroes have access to the best and rarest weapons and will stand out visually from the rest of the soldiers. First person cover system: Experience the ultimate firefights that a cover system allows, from the immersion of a first person view. Peek or blind fire over and around cover and more. Unique Focus – the Battle of Stalingrad in depth: takes the familiar WWII genre into a unique direction. Far removed from the well-trodden Normandy setting, gameplay is based on fresh scenarios and actions the player has never experienced before. Follow the German army as they assault the city of Stalingrad, to the banks of the Volga. Follow the Soviet army as it holds the city against all the odds then destroys the Axis forces. Immersive First Person Tank Warfare: experience what it was like to fight inside one of these metal beasts in WWII with the most immersive first person tank warfare ever created. Fully modeled 3d interiors, a full AI crew, and advanced armour and damage systems create a unique tanking experience.